President Muhammadu Buhari with the FCT Traditional Rulers, Ona of Abaji, Baba Adamu Yunusa and two others during their Sallah Homage at the Presidential Villa in Abuja. PHOTO: SUNDAY AGHAEZE. JUNE 15 2018. President Muhammadu Buhari says participating in the 2018 Ramadan Fast has improved his health and made him more fit to handle national issues. 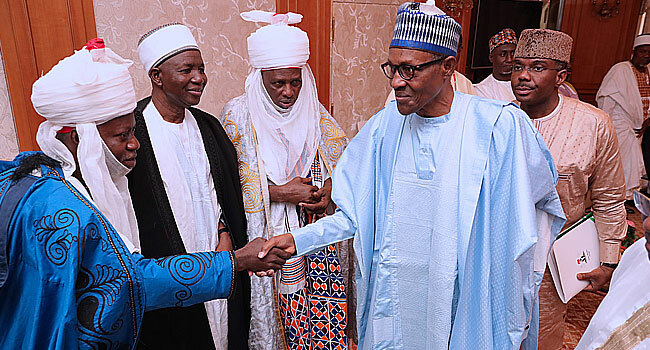 The President disclosed this on Friday when some Muslim faithful and Christians led by the Minister of the Federal Capital Territory, Mohammed Bello and the Chaplain of the State House Chapel, Pastor Seyi Malomo paid him a visit at the Presidential Villa, in celebration of Eid-El-Fitri. President Buhari noted that he could not participate in the spiritual exercise last year due to ill-health. “I am very grateful to the ministers and church leadership that came to say happy Eid-Fitr to those of us that have been fasting. “A lot of people advised me whether on health grounds, I could default. I refused because I realise the value in fasting. I cannot miss it once I can do it. “Last year, I didn’t because I was on health vacation. But this year, I have done it and I thank God because it has helped me to be much more healthier to give me the time that I need to attend to national issues,” the President said. 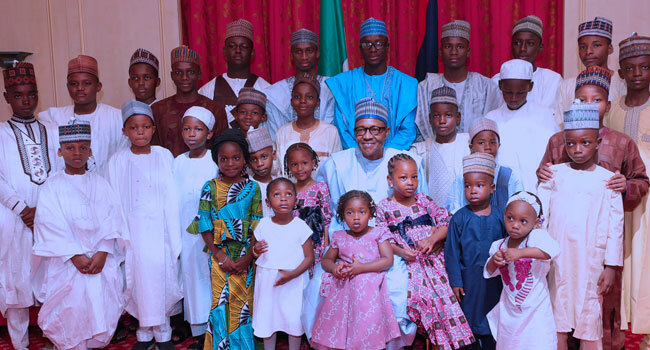 President Buhari with children at the presidential villa. He, however, enjoined all Nigerians to work together confidently irrespective of religious beliefs to salvage the nation. He told traditional rulers, service chiefs and government functionaries present that all Nigerians must work together to salvage the nation’s assets. President Buhari on August 19, 2017, returned to Nigeria from a medical vacation in the United Kingdom after spending more than 100 days.